After spending a day finding out about the possibility of buying a motorbike and then making a tourist trip over to Elephanta Island I decided I had had enough of Mumbai and would head straight to the rural agriculture research place, NARI near Phaltan. So on Sunday morning I headed to central Mumbai train station and bought 2nd class unreserved ticket to Pune (sometimes spelt in the more phonetic way, Poona). The journey, again, was an interesting one - Indian style. There was a big rush to get into the train as soon as the doors opened. I was not in such a hurry as there didn't seem to be enough people to occupy all the seats, but apparently I was wrong. Each person aggressively defended a number of seats for their friends or family who would turn up later. Then the remaining seats were guarded by young boys who didn't have tickets but would only give up a seat in exchange for money. After walking away towards the next carriage the requested price soon dropped and I decided to pay the Rs. 10 (about 13p) in case I couldn't find another seat. I probably should have just cuffed one of the boys round the ears and claimed the seat for myself, but I later discovered other late arrivals were happy to pay the ransom. So maybe it is the done thing if you want to turn up late and can afford to pay a little more. Still considering I only paid Rs. 50 for the 3 hour journey, another Rs. 10 seemed a rip-off. At first the journey was comfortable, but at the next stop a few too many people got on. Then the next stop many more people got on. Eventually we were packed in like sardines and I was squashed against the window sharing my seat with an old man and people where occupying every inch of floor and overhead luggage space. Still, I had a nice view of the mountain pass and I managed to wrestle myself and my bag out at Pune station in time. I was not impressed with Pune, or at least of what I saw of it: it was lots traffic penned in by tall walls. Not a nice place to walk. But walk I did as I still prefer to find my own way and ask people where is a good place to stay. I headed to the backpackers area of town. Here I found a number of westerners dressed in purple robes that looked in a world of their own. They were attending an expensive meditation resort. I stopped to talk to one one of the robed people, but she didn't seem to know much, though she tried to be helpful. Other westerners all seemed to be in a mood and avoided eye contact. Was it the way I looked? Did they not like seeing other westerners in a backpackers hangout? What ever their reasons, once I had haggled the price of a room down to a more reasonable, yet still expensive rate of Rs. 300, I hung out chatting with the locals who were much more friendly. I also had a nice conversation with an Iraqi student who was in India studying for a masters in English. The next day I walked around the market area and had a Rs. 20 shave and slowly made my way back to near the train station were I arranged to meet an intern from NARI who was on his way back after spending a couple of days in Pune. Having an hour to kill I was delighted to find a secret garden were I was able to lie down in peace. It was quite a luxury. I later found out on GMapCatcher that it is called Wilson Garden and located here. After a dusty and bumpy ride on a bus with the intern we arrived at Phaltan and went straight to a local restaurant to eat. I was surprised how cool it was. I am told that it is due to the number of farms in the region: all the water evaporating from the field s the air right down as soon as the sun goes. I was told that the temperature often drops to about 12 C, even though every day it is a pretty steady 30 C.
So here I am in Phaltan. NARI kindly has provided me with accommodation, consists of a room, private toilet, kitchen and dinning room, with the latter two shared with the intern. So, although simply furnished, it is more than I need. Of course I wasted no time in finding out my coordinate. I have been keeping pretty busy since I have arrived, which is why I have not given an update before now. Life at the moment consists of getting up at 8 am, washing, having misel (curry on bombay mix with thicker curry on the side and a couple of chapati's. Then I hop on the back of the interns motorbike and we ride the couple of miles to NARI's offices and labs. 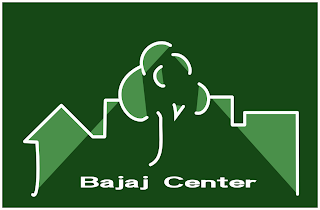 My first job is to create a website for a new centre, the Bajaj Center that will offer educational programs and host conferences on sustainable development. I have also been busy helping the intern finish off a brochure about the centre and today I designed a logo for the centre, attached. It is a stylised profile of the centre buildings. Let me know what you think as there is still a little time to modify or redo it. My next job will be to try and solve a technical problem with an ethanol lantern/stove that NARI developed. At about 1pm I walk to the end of NARI's drive and eat a set meal at a road side cafe, which always consists of a stainless steel tray with some rice, chapati's, thick curry, a small pot of very sour liquid yoghurt and a pot of liquid curry. (I don't eat the tray.) It makes a good meal and tastes nice, but we have pretty much the same for dinner too and I am beginning to miss some fresh fruit and veg. On the weekend I must buy some in town. I only get Sunday's off and unfortunately this Sunday will also be the last day that the intern will be staying here. It is a shame because we have got on well and it will probably get very lonely in this house all by myself. It feels a bit like when I stayed in Italy in a flat in a small village near the lab. Only then I had a rented car. I have to sort out my transport soon. I am reserving my judgement about NARI still because I have yet to visit their animal husbandry department and to find out if they perform any research of which I would disaprove. But my first impressions are good and I like the challenge of solving the problem with the lantern, which is effectively stabalising the temperature of the ethenol gasifier. Any questions I have about NARI's policies should be resolved soon when I design their website, as I would like to include some policy statements on it. As you probably saw on google maps on my above links, is that the surounding area is very green with fields. The main crop here is sugar cane. The land owners here are pretty rich. Unlike the North of India that I visited 5 years ago, most people have tractors. It feels quite industrialised, with an air-raid siron going off in the morning and evening - assumably informing the labourers when they should be starting and finishing work. This is nothing to do with NARI I should add, and whom I believe only uses oxen to plow its fields. The rich local land owners are easy to spot because they all seem to drive expensive big new silver cars and land rovers - quite the opposite to NARI's style, which strongly believes that all greed should be firmly kept in check. Half of the rest of the people here still seem to be able to afford motorbikes and the other half either cycle, walk or take a ride in a trailer. Sorry, again this was a bit of a long one. Until my next adventure, which might be this Sunday, good bye!